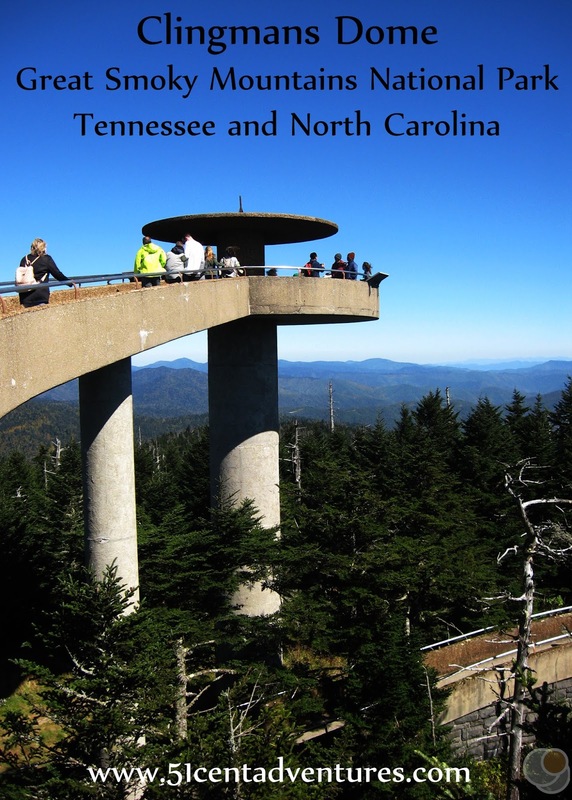 Clingmans Dome on the Tennessee/North Carolina border is 6,643 feet above sea level. 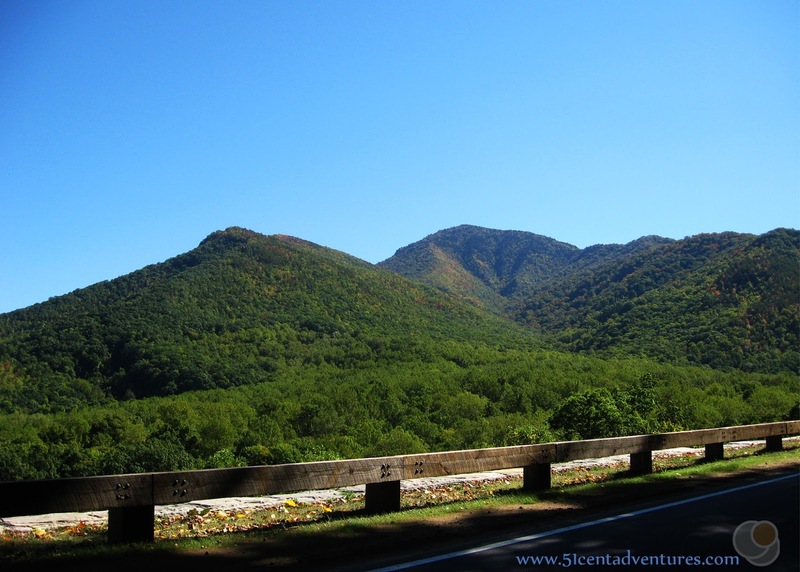 It is the tallest mountain in Tennessee, and the third tallest mountain east of the Mississippi River. There is a 45 foot tall observation tower located at the summit of Clingmans Dome. 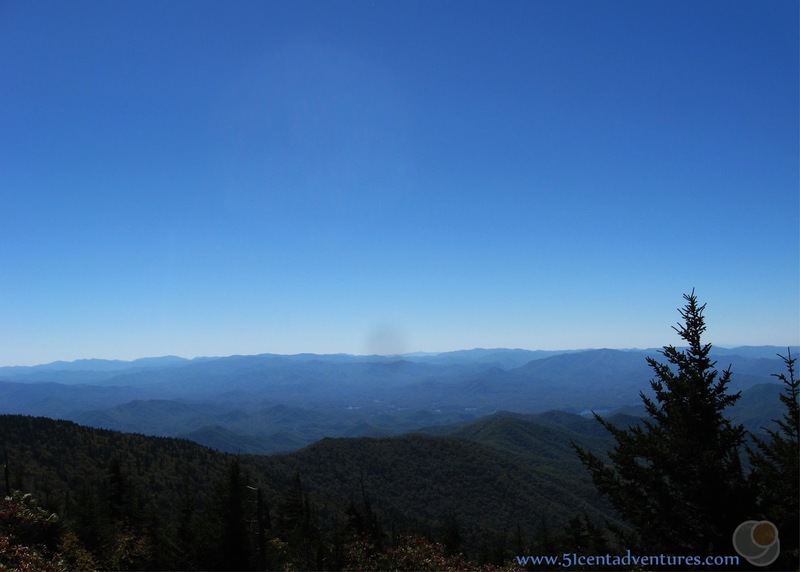 Part of the Appalachian Trail runs across Clingmans Dome. 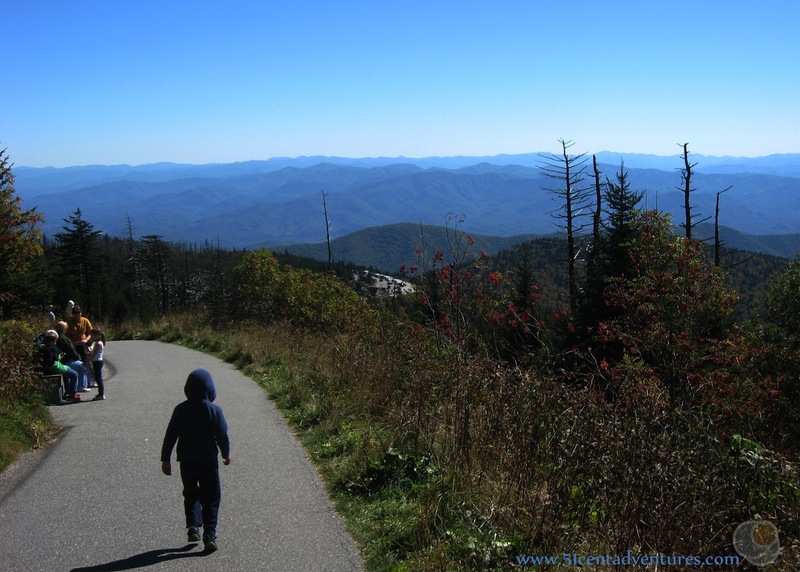 But that trail isn't the only way to reach Clingmans Dome. You can drive up most of the mountain. However, you will have to climb up the last 1/2 mile via a paved yet steep trail. 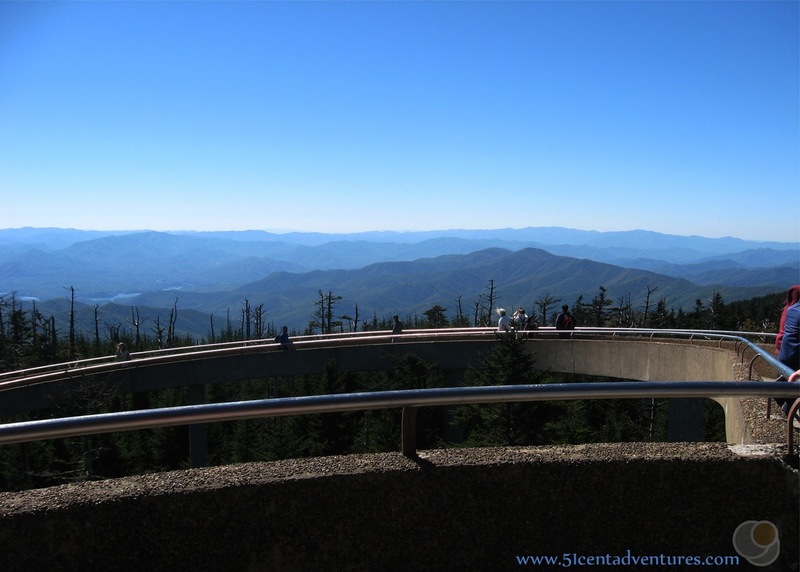 Location: Clingman Dome is located in the heart of the Great Smoky Mountain National Park on the border of Tennessee and North Carolina. Cost: Completely Free - though plan for the area to be crowded if you are there on a holiday or a weekend. Operating Seasons and Hours: The observation tower is open year round. 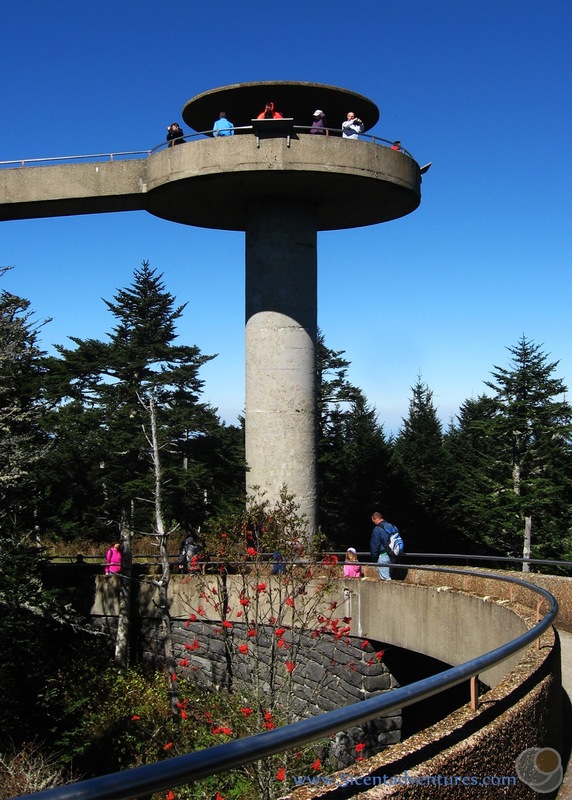 However, Clingmans Dome Road from Highway 441 to the parking lot is closed from December 1st to April 1st every year. This was the second stop of the third day of our road trip to Tennessee and Kentucky in the fall of 2016. 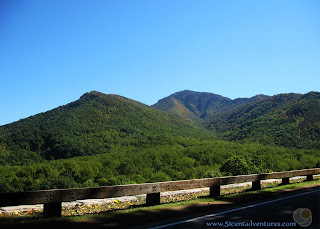 We'd spent the previous night at the Cosby Campground in the Great Smoky Mountains National Park. 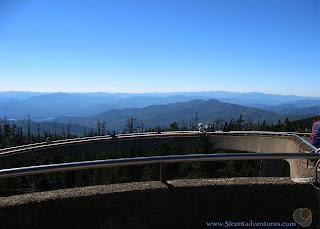 Visiting Clingmans Dome was one of the main things I wanted to do during our trip to Great Smoky Mountain National Park. Apparently it was what everyone else in the area wanted to do too -because there was quite a bit of traffic all over the park. 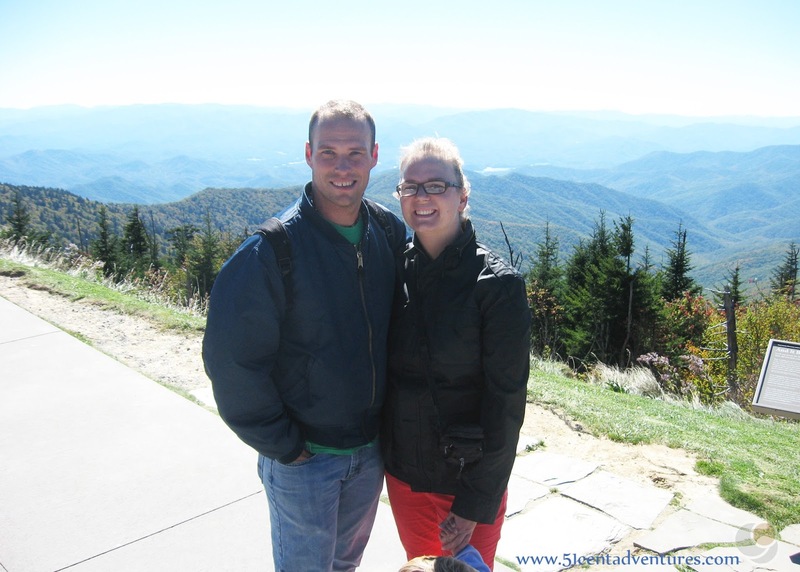 We stopped at the Sugarland Visitor Center at the turn off for the road up to Clingmans Dome. My husband and I weighed our options for going up to Clingmans Dome. On the one hand we knew traffic was going to be insane on top of the mountain. On the other hand we really wanted to go up there. After a bit of debate, seeing the mountain won out. So we got back in the car and started our drive up Highway 441. 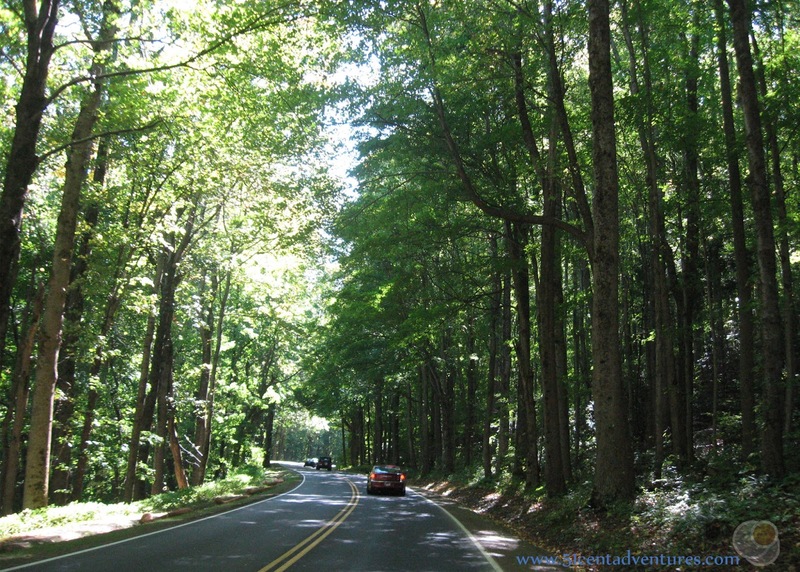 This road connects Gatlinburg Tennessee to Cherokee, North Carolina. The drive started out low and we could see many tree covered mountains. Of course we didn't know it at the time, but 6 weeks later these trees would be burned in the horrible fire that swept through the forest in late November. Driving through the trees was enchanting. 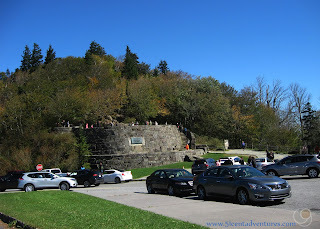 The Newfound Gap is at the summit of Highway 441. We could have explored this area, but we wanted to go even higher. So we turned off of Highway 441, and onto Clingmans Dome Road. So far the traffic hadn't been too bad. There were cars around us, but we'd been moving at a steady pace. The situation was different on Clingmans Dome Road. After going only a few miles we slowed to a crawl in a long line of cars. We were in that line for about an hour as we inched our way toward the parking lot. Many cars pulled off to the side of the road and the people just started walking up the road rather than wait in that long line. Since we had four children under the age of 6 we opted to wait until we got to the parking lot. We saw some pretty great views as we crawled up the road. Finally we made it to the parking lot. I was a little worried we wouldn't get a parking spot, but then one opened up in front of us. We hopped out of the car and were greeted by an amazing view and a cold breeze. My youngest freaked out and insisted on being carried. The older kids weren't too happy about what was going on either. Pay careful attention to this next part, because I was completely surprised by this fact. 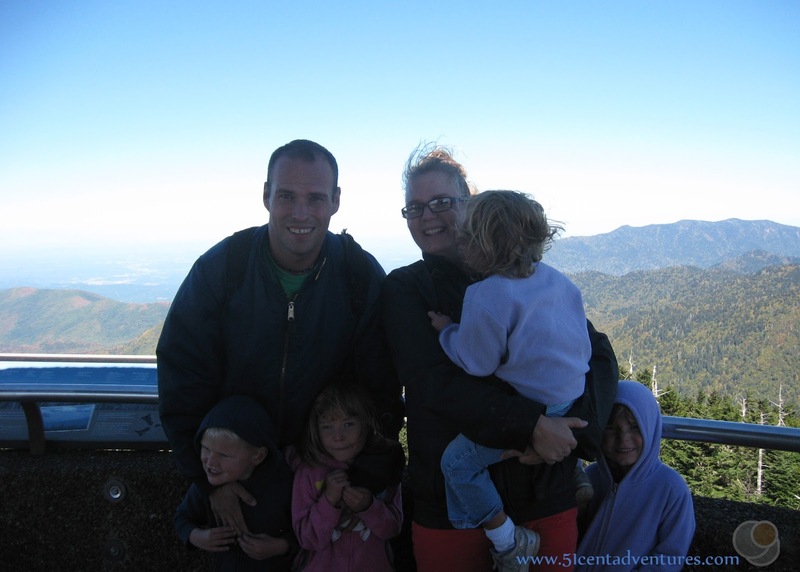 If you want to stand at the top of Clingmans Dome you will have to hike up a STEEP hill. Somehow I hadn't realized that we'd still have to hike 1/2 mile up the mountain before we reached Clingmans Dome. I'd just assumed that we'd be able to get to the observation tower as soon as we got out of our car. I guess that's what you get when you skim travel websites. If you have young children don't plan on bringing a stroller. 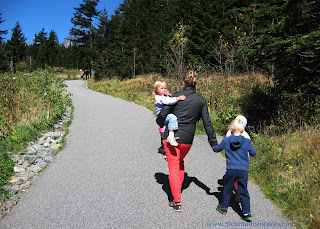 The hill is almost too steep to push a stroller up, and it's way too steep to safely roll a stroller back down. And wheel chairs are out of the question. 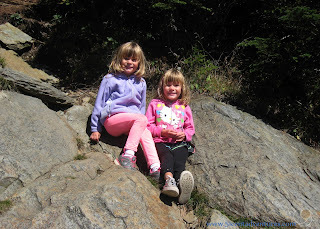 We started hiking up the steep trail. My three year old insisted on being carried, by me, the whole way up. Thank goodness I'm in good shape. After much whining from the kids we made it to the top, and could see the Observation Tower. The kids weren't so sure about going up the ramp to the top, but they did it anyway. Here we are celebrating the fact that we were standing at 6,643 feet above sea level. This is the highest point in Tennessee and the highest point on the whole Appalachian trail. There are only two other mountains east of the Mississippi River that are higher than this spot. We didn't have much time to appreciate it though because none of the kids were very happy about the stiff breeze that seemed to be blowing from all directions. The view was amazing though. Apparently we could see into 7 different states from up here, though I had no idea which states nor where they were located. 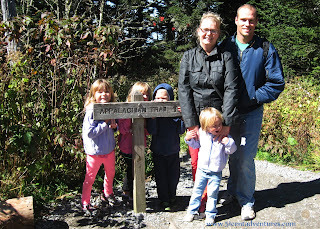 Before we went down the paved trail to the parking lot we made sure to take a picture with the Appalachian train sign. 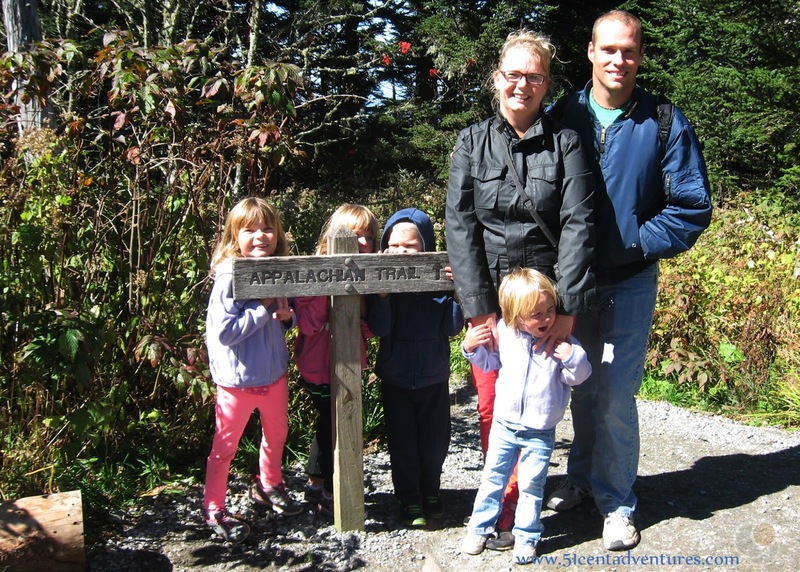 The Appalachian trail spans from Maine to Georgia. We'd walked on maybe 100 yards of it. The trip back down the trail was a lot less arduous than the hike up. The kids were in better moods and my daughter actually walked a lot of the way - which was good because my arms needed a break. The twins got really excited about climbing on the rocks on the side of the trail. They even saw a little snake while they were exploring. Here's the view going down the trail. You can see the parking lot in the center of the picture. When we made it down to the parking lot we hurried to get back into our car so someone else could have our parking spot. Most of us needed to use the bathroom, but there were long lines for the vault toilets. I told my husband, "we can get down the mountain faster than those lines will move." So we drove back down the mountain and used the bathroom at the visitor center. We also had another snack/lunch. Even with the heavy traffic our trip up the mountain had been worth it. After spending months close to sea level it was amazing to stand somewhere so high. Here's something ironic though. 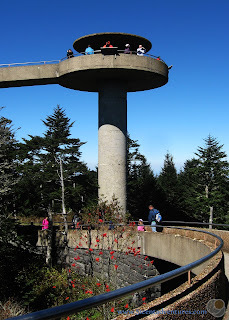 I spent months dreaming about this trip to Clingmans Dome so that I could stand at the highest spot in Tennessee. That was 6,643 feet above sea level. Since then my family has moved back to Utah. And I currently work at a ski resort in the mountain operations building. My office is located at 6316 feet above sea level. I barely think about that when I commute up there four times a week. Recommendation: There aren't many mountains that are as easy to summit as Clingmans Dome. Sure there is that 1/2 mile hike at the end, but the trail is paved and well maintained. 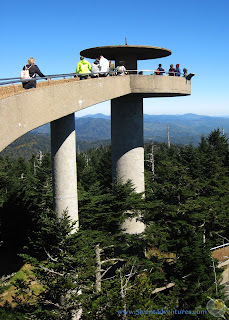 If you want the thrill of summiting a mountain - without the hours spent hiking - then Clingmans Dome is perfect. Just make sure you aren't going to be there on a busy holiday or weekend unless you want to spend hours in your car. Directions: In case you missed it earlier, the observation tower at the top of Clingmans Dome can only be reached by hiking 1/2 mile up a steep trail from the parking lot. 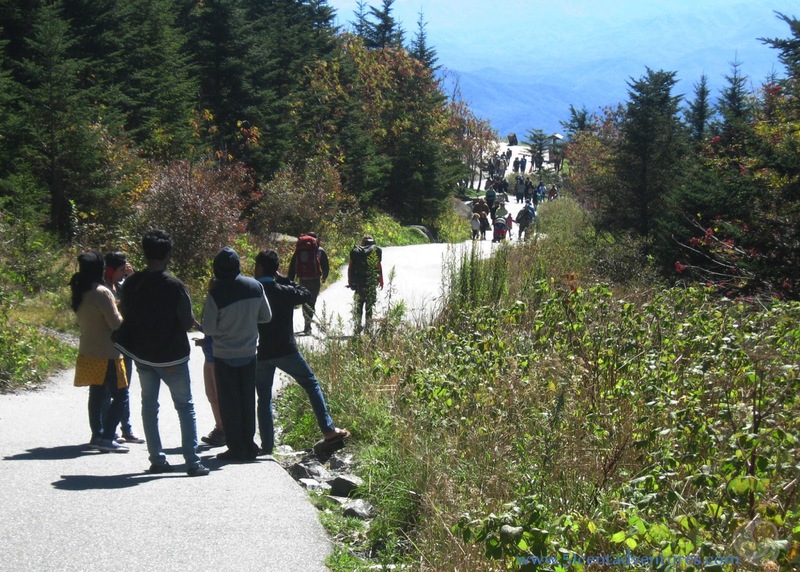 The parking lot is located at the end of Clingmans Dome Road. 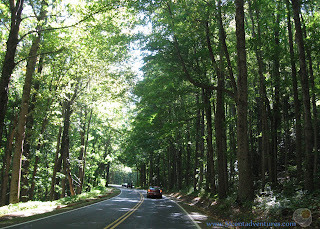 And that road branches off of Highway 441 which runs between Gatlinburg in Tennessee and Cherokee in North Carolina. Places Nearby: Mt. Mitchell (6,684 feet) and Mt. Craig (6,647 feet), are the only two other mountains east of the Mississippi River that are higher than Clingmans Dome. both are located in Mt. Mitchell State Park which is about 100 miles away in western North Carolina. 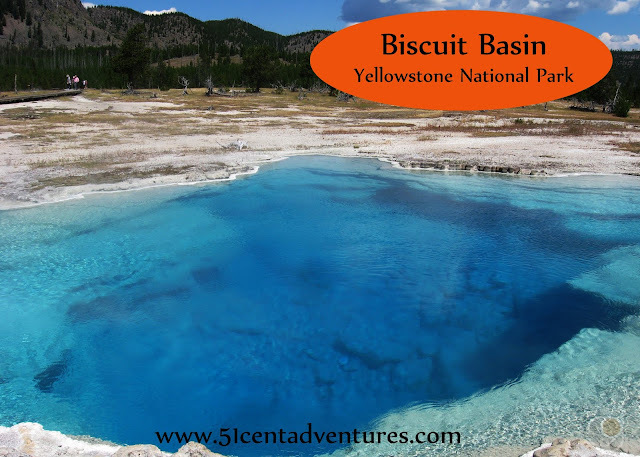 This would be a good little side trip if you are interested in summiting more mountains.